For those who struggle with sexual addiction, the “Where To From Here?” study guide for individuals provides a Christ-centered, in-depth walk through the twelve steps of RSA (Renewal From Sexual Addiction). 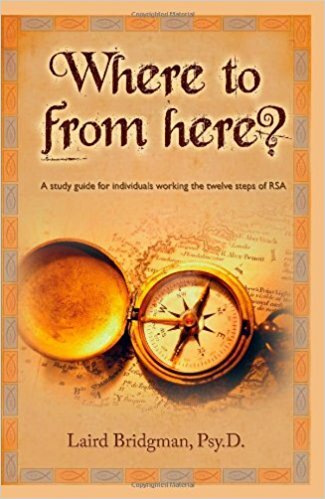 “Where To From Here?” combines the best of traditional 12 step recovery wisdom and the unique wisdom and experience gleaned from RSA members since 1993, with current cutting-wedge technology from psychology, and the guidance and inspiration of the Scriptures. This truly unique work will guide you in applying each of the twelve steps in your own life to help you achieve and maintain sobriety. The author, Dr. Laird Bridgman, is a licensed psychologist, a Fellow in the Academy of Cognitive Therapy, and an ordained minister. He is the founder of Renewed Hope/RSA Ministries, a non-profit organization dedicated to providing Christ-centered, 12 step recovery programs and materials for those who struggle wih sexual addiction and for those who love them.